Have you ever heard of the chapparal ecosystem? Learn all about this dry, Mediterranean ecosystem with this fun sheet! Complete with an informative paragraph, some fun facts and a word search, your student will come away as an expert. Who knew that the beach had its own diverse ecosystem? Learn all about the shoreline ecosystem with this fun worksheet! Give your student a fun reading page and word search, filled with fun facts all about the Earth's desert ecosystem. 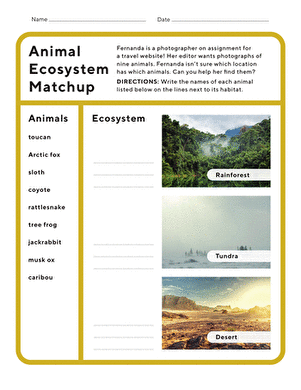 Give your student some fun facts and reading about the ecosystem of the Arctic. Did you know that there are forests in the temperate ocean ecosystem? Learn all about the temperate ocean with this fun ecosystems sheet! The tropical ocean ecosystem is home to tropical fish, coral reefs, and warm water! Learn about the polar ocean ecosystem with this fun sheet! Learn all you need to know about our purple mountain's majesty with this fun ecosystems sheet! Did you know Phoenix, Arizona is located in a desert ecosystem? Learn more about Phoenix with this fun sheet!